While New Jersey Democratic Senator Cory Booker and his congressional colleagues were in Washington, D.C., participating in congressional hearings for high-profile cabinet appointments, his mobile office was at City Hall in Bayonne fielding concerns from constituents. Local residents came out to voice their concerns about national issues, like healthcare and insurance costs, unemployment, taxes, environmental issues, and national security. 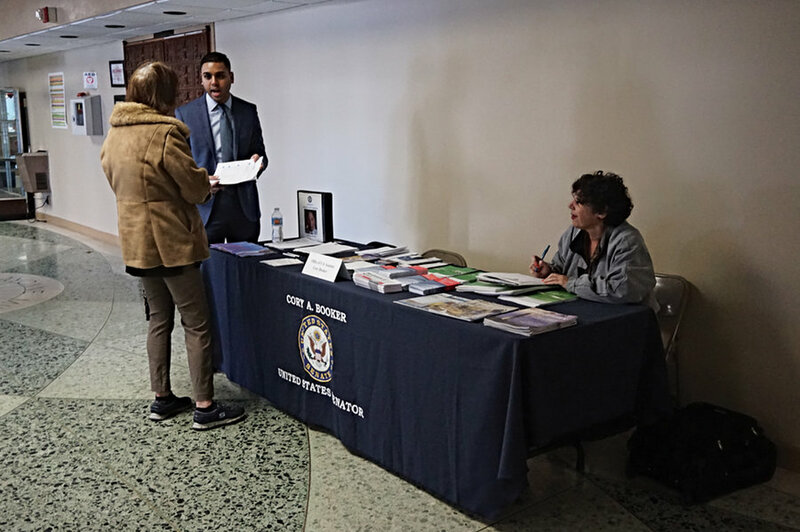 Dinesh Suryawanshi, a staffer for Booker, set up a table to distribute resources while fielding “incoming casework” for federal issues. “[Senator Booker] has been crazy busy in D.C., but we want to make sure our offices are outside in the community, getting feedback from constituents that don’t necessarily have access to internet or TVs,” said Suryawanshi. Residents come to provide their senator “legislative opinions on various bills,” he said. Residents had plenty to discuss. Aside from the political dysfunction in Washington and Democratic opposition to the President’s cabinet picks, Bayonne residents came to the mobile office with every-day-life issues that Booker can address with his votes in the U.S. Senate. Jennie Serafino, 56, lost her job two years ago after working for the Bayonne School District and the City of Bayonne for decades. She hopes Booker will advocate for those like her who find themselves shut out of the labor market. Serafino said she did not qualify for a state housing program to help with her mortgage, so she is finding out what kinds of federal programs she might qualify for. “I don’t know what the solution is, but I think we need to do something about national security,” said Eileen Sullivan, a nurse from Bayonne, voicing support for the sanctions imposed by President Trump in an executive order in late January, and blocked by a federal appeals court last week. Booker, elected to the Senate in 2013, represents a state where there have been serious security scares, like a pipe bomb found in a backpack near an Elizabeth train station in September, 2016, and a pipe bomb explosion in Seaside Park that same week. Economically, jobs in NJ have been hard to come by for low-skilled and older workers, a problem the state has yet to find a solution for. Residents’concerns are valid, and Booker is set to address all the issues and then some. Upcoming issues will be the repeal of the Affordable Care Act, which Sullivan, a nurse, views favorably, as do a majority of voters polled in an NBC/Wall Street Journal poll released in January. Republicans in the Senate have a majority in both the Senate and House of Representatives, posing a major hurdle for Democrats like Booker and NJ Senator Robert Menendez to stop legislation unpopular in NJ from hitting the law books – laws such as stricter immigration rules and cuts to education funding. But popular laws such as an infrastructure stimulus may be an olive branch between the parties. For now, the two sides are fighting it out over cabinet picks, likely to be followed be a slew of other partisan issues. Booker, and other congress people across the country, have reported record mail, voicemail, and email communications since Trump’s election. The question is whether those concerns will be met with solutions.